Income is a powerful determinant of health and educational opportunities. The evidence shows poverty to be as an important a health risk as high blood pressure, high cholesterol and smoking. Children growing up in poverty are less likely to complete their education and more likely to experience difficulties finding and keeping jobs. Agencies and groups who work with those experiencing poverty can help them find programs and benefits they are eligible for to raise their income. We have worked with Manitoba physicians, health care providers and other groups to adapt a set of tools which can be used to address poverty. Get Your Benefits! is a 20-page plain language booklet listing many federal, provincial and regional benefits and programs individuals and families living in Manitoba may be eligible for. Visit the Get Your Benefts Website for more information about the individual programs and benefits, as well as the benefits of filing tax returns. 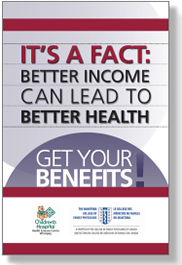 It's a fact: Better income can lead to better health, education and welfare.